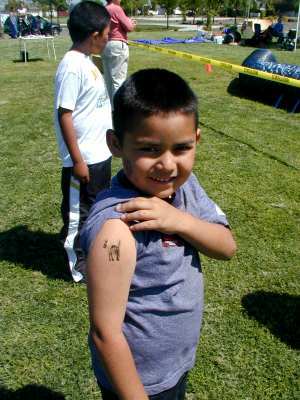 Tattoo paper that will let you make your own tattoos at home using any inkjet or laser printer. Simple to use. Buy now using our shopping cart. Orders will be posted within 24 hours. 1. Design tattoo on your computer. Mirror the image if any lettering. Duplicate the image(s) to fill the page. 2. You can test print your page on ordinary paper first. When correct, print your design(s) on to the glossy side of the tattoo paper. 3. Peel off the adhesive clear sheet from the other piece of paper and apply to your printed sheet over the images when dry. THE INK MUST BE DRY. 4. Cut out your design(s). Store in a cool dry place. 5. When ready to use remove the clear film and place card face down on the skin. Wet the back for 30 seconds and peel off the backing film.